Blowout Sale! Save 53% on the iMeshbean® Professional Ionic Ion Detox Foot Bath Spa Machine USA (Model-04) by i-mesh-bean at Beauty Sols. MPN: IF004. Hurry! Limited time offer. Offer valid only while supplies last. Main Function 1. Remove toxins, free radicals and body waste products that can cause health problems. 2. Chelate toxic metals 3. Raise pH levels. 1. Remove toxins, free radicals and body waste products that can cause health problems. 3. Raise pH levels. Approximately 95% of people experience a state of acidity in which their blood pH is lower than 7.45, indicating an excess of hydrogen ions. This makes an ideal breeding ground for worms, parasites, microorganisms and other critters that lower body function and cause disease. 16. Improve sleepTwo independent systems in one main unit -- two people can enjoy the experience of detoxifying together! 17. Safe to operate.聽 Wrist straps keep the user(s) grounded & static-free. 18. 6*10CM LCD screens New design, broaden your views. 19. 5 mode for customer's selection for different detox need. 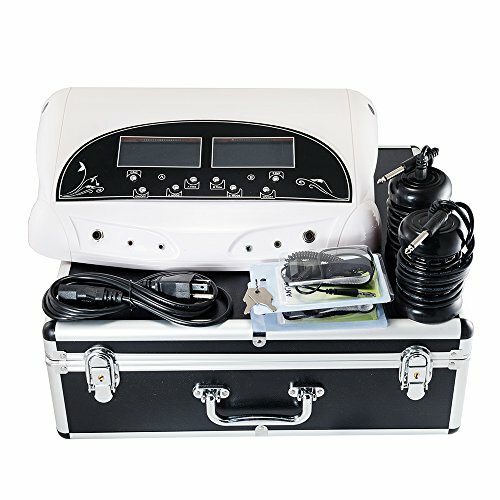 Newest Model Foot Detox Machine with double LCD Display. 2 x Arrays (can be used for 30-50 times). 2 x Far Infrared Waist Belts (with Bamboo Charcoal). 1 x Power Cable ( matches your country standard ). 1 x English Instruction Manual. NOTE: U will get a lamp for gift, we may send it from different warehouse. Daul system working With the detox function MP3 function Safe to operate. CE Approved and used by Professionals. Wrist straps keep the user(s) grounded & static-free. Far infrared waist belt has benefit on: physical therapy, lose weight and beauty effect.